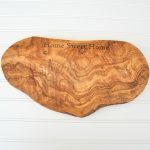 This is a beautiful olive wood rectangle cutting board, hand crafted from a single piece of olive wood. Our olive wood boards are guaranteed to never made from joined or glued pieces, always single pieces of olive wood. 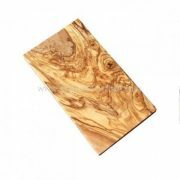 This olive wood cutting board is a rectangle shape, measuring 12″ x 6″ x approx. 0.5″. 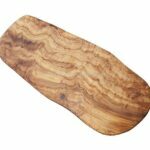 Use this olive wood board as a cutting board, serving board, cheese board or even as a trivet. These cutting boards are decorative as well as practical and are colored and patterned by the natural grain of the wood. Olive wood is a great material for durable cutting boards because it is hardwearing and long-lasting. Due to the natural color and grain of olive wood no two of these olive wood rectangle cutting boards are ever the same. We can also offer this olive wood board personalized! Please see our personalized olive wood cutting boards section for all our engraved and personalized olive wood products. Hand wash only. Olive wood is not suitable for dishwashers. Occasionally coat with olive oil to prevent the wood from drying out. Do not leave these products soaking in water or exposed to heat or sunshine. Naturally Med's olive wood products are all made from a single piece of olive wood. 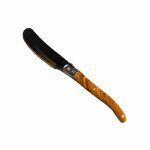 Single piece olive wood products are durable and long-lasting. The natural patterning of olive wood makes each item unique.